I am excited to announce I have been working on a new project with Heather of Heather Shane Photography! We are getting together monthly to bring you gorgeous locally grown arrangements and flower inspiration (#flowerofthemonthseries). Heather and I met in a park in Orange County to snap photos of me arranging mini calla lillies, tulips and maiden hair fern. I have to admit that I was blown away when I saw the photos from Heather. She snapped all the flowers against a concrete wall and the texture and the colors that came through the camera are stunning with the purple and green flowers (that's why she's a photographer and I stick to the flowers)! Want in on a secret? I picked up the tulips and the mini callas at Trader Joe's and spent under $40.00! ...Sometimes Trader's sells flowers at a ridiculously low price that you can't even get at a wholesaler. I grabbed the mini callas for $3.99/bunch - that's unheard of! 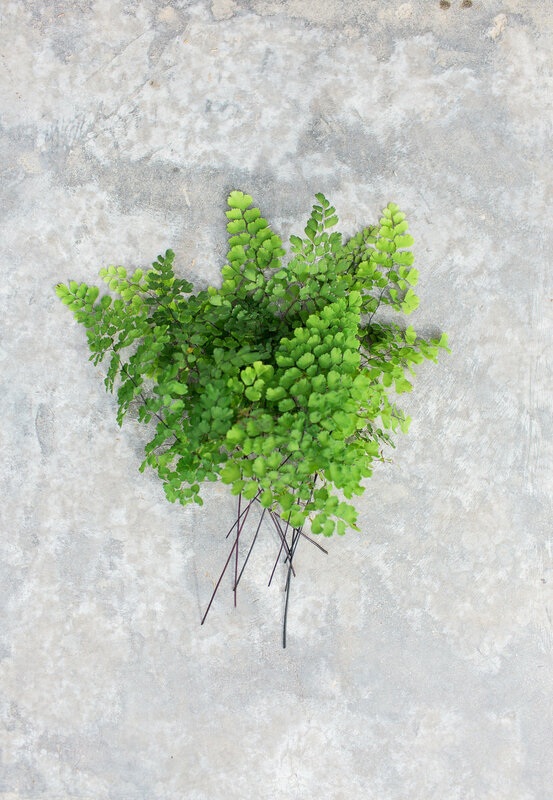 The maiden hair fern was grown in my yard and I cut a couple of stems to add a lacey texture to the arrangement and bouquet. Heather and I thought it would be nice to show how you can use the same flowers in a bouquet and then re-arrange it as a centerpiece. For the bouquet, I added a bit of green moss around the base of the blooms to create a collar and add some interesting texture. For the centerpiece, I went with a contemporary silver container to show how traditional flowers can still have a modern/contemporary vibe if done correctly. The silver container also really helped the purple callas and tulips pop. Enjoy these seasonal CA grown January blooms and check back here monthly to see what we come up for our Flowers of the Month Series!